In Digital age people expect advancement in every aspect of life especially in smartphone devices. Every time the android apps development releases a new version of OS it’s been a very big deal because of the new apps and features. Google expects more users from developing countries it wants to provide the latest generation affordable smartphone that provides more storage space, faster ram and help data consumption. Android Go is the minimal version of the high-level OS it is created on the idea of being used in low specification smartphones. It can be used to capture potential markets in the developing nations where people expect mobiles phone with an affordable rate and smooth running OS. It is created to handle a high user base on one side, On the other hand, face limitations from low storage spaces, high app size, and Low RAM size. The operating system has been based on Oreo but the advantage is that it has been optimized to run on smartphones with 512mb to 1 GB RAM size. When compared with android Nougat it occupies less storage space to hold a number of apps and media. This OS helps the apps to open faster and has Data saver feature which runs on default mode that helps the user to consume lesser mobile data. Android Go has its own set of apps that have been created specifically for them. These apps will require 50 percent or less space and perform very well in low-end specification mobiles. They come with only a few pre-installed apps. 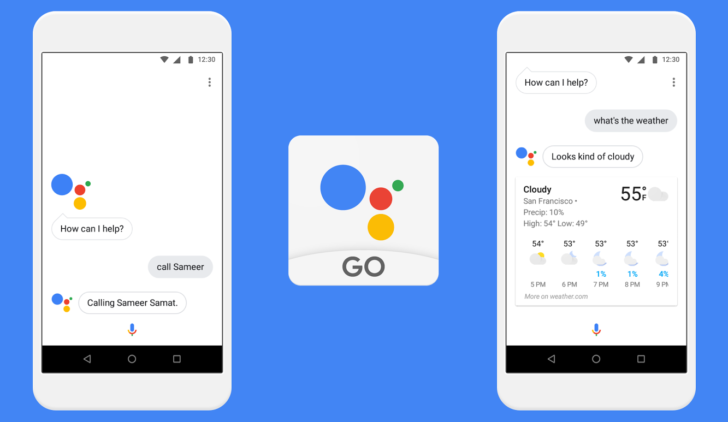 These apps may be specifically created for Android GO but it has some drawbacks For example, you can’t set reminders or control smart home devices from assistant GO but you can do standard things like set alarm open apps and ask different questions. Android Go is basically created for low specification mobile so in that idea, even the play store is being optimized into giving suggestions for the users. It may be designed for android Go but all the features of the play store will be the same only difference is that it shows apps for low storage devices. Use the same app for android (Go edition) devices and all other devices in order to have similar experience. So in this way, you are enhancing your running app to work smoothly in these devices and your existing users gain upsides from these optimizations. This app may be based on multi-binary, but does not have particular experience for Low RAM devices. Google deeply motivates you to have the experience of using the new Android app bundle to have 65% in size savings, without having to refractor your code. Use the same app for Android (Go edition) devices and all other devices, for having a different set of experiences. In order to experience this, you have to develop different APKs, for one to target the new Android, hardware, ram, low dimension and other APKs focusing on other devices. Go edition is basically created to fit into low specification smartphones so there is a version of “lite” has been created. This particular version of the app has a lot of variance from the original version but still works smooth and it can be used in any type of device. Most apps in the play store have been found with ANRs and crash so because of this issue the users were compelled to uninstall and also it will lead to high uninstall rates. The main thread is doing simultaneous binder call to another process and that other process is delayed in returning. Synchronized block for a long operation is happening on another thread so the main thread is delayed. The main thread is being delayed due to deadlock with another thread because of process or binder call. The main thread is waiting for the operation to finish but waiting for deadlock. This edition of the OS will have a lot of resource optimization such as Background execution limits, which make sure that processes run smoothly while keeping the device cool. Most of these tools are designed to improve your battery life and overall phone performance these tools make sure that the user should have a great experience. There is a very clear connection between APK size and install rates. As the android Go users will be focused on Apps that have a very low size so there won’t be any problems related to storage issue. This is why the app store will display the size of the app in the description. The Android Go edition smartphone has less than 1 GB of RAM. The OS is improvised to run in efficient and low memory devices and the key focus is that app or game is optimized to use the memory. When APK is being tested PSS (Proportional set size) has to be checked to how much memory will be utilized. Preparation is the focus here; makes sure your app opens within a limit of 5 seconds. In a recent survey based on mobile apps, most of the users prefer their apps to open within a few seconds if not it leads uninstall and abandonment. Always measure the time take for the app to cold start after it is being downloaded so that the user will have an interactive experience of android apps development.